Panel: Unus Mundus Transcendent truth or comforting fiction? Abstract: This panel is a series of presentations by a father and his three sons. The first is a critique of the concept of the Unus Mundus, an idea that goes back at least as far as Plato’s Cave in western intellectual history. A longing for unchanging foundational ideas lies at the core of much of our culture, psychology, and theology. The subsequent presentations describe various unforeseen, destructive results stemming from the perspective of the Unus Mundus. The first example is of persons with Alzheimer’s disease, whose singular subjectivity is often ignored because they are seen as a category. They are ‘Alzheimer-ed’, subtly enabling those around them to avoid an anxiety- producing encounter with their enigmatic otherness. Another important perspective is the modernist re-construction of city spaces that has resulted in the loss of an organic sense of containment. The lengthy horizon of the grand boulevards seemed like openings upon infinity, often provoking panic and agoraphobia, as seen in the work of Edvard Munch. Lastly, the genocidal tendencies of modern times epitomize the dangers of totalizing, Utopian ideas. Violent elimination may be visited upon groups or peoples who are deemed ‘impure’, as besmirching idealized social visions. Such examples illustrate some of the ethical dangers of conceptualizations related to the Unus Mundus. It’s very special to be here with my sons, and to be able to share their thoughtfulness and creativity. My own task is to introduce our panel in this segment, entitled ‘Fragmentation of the Unus Mundus’. I approach this task with a bit of trepidation! As we know, the Unus Mundus lies at the core of Jung’s thought, and his privileging of this ideal reflects his longing to found an all-encompassing theory (Shamdasani 2003; Samuels 1985, p. 89ff.). The search for universal ideas, often with Utopian implications, has been a perennial quest for philosophy and psychology. We, too, as clinicians are tempted to ‘reduce the universe to an originary and ultimate unity by way of panoramic overviews and dialectical syntheses’ (Peperzak 1997, p. 4). But Emmanuel Levinas, in a postmodernist mode, points out the negative ethical consequences that may ensue from such ways of conceiving the human condition. The ‘Face of the Other’, including our patients in all their complexity and creativity, may be subsumed to an idea. My thesis is that Jung, for all his genius, falls prey to this very danger by privileging the Unus Mundus, and that this has had important implications for analytic theory and practice. But more about this later. Jung describes the Unus Mundus as an experience where ‘opposites’ are transcended by unity, and an awareness of synchronicity becomes possible (Aziz 1990; von Franz 1975, p. 249). It serves as an implicit goal or telos, toward which a ‘spiritus lector’ (a spiritual guide in dreams or active imagination) leads the individual toward a ‘unio mentalis’ (a union of self and body/matter). This eventuates in the union of the ‘whole man’ with a transcendent ground that is presumed to be foundational (Jung 1963/1970, paras. 759–75). In the postmodern era, however, one can see how such foundationalism repeats a primal error of modern thought that can be very destructive in its unforeseen effects. My three sons will provide different examples of how the foundationalist search for truth and progress, for ‘Enlightenment’, has often had unpredictable and sometimes disastrous ethical consequences. Our hope is that these dramatic examples can help free us from our implicit biases toward a reified oneness or totality. The primal dilemma can be traced back to the origins of Western thought, especially to interpretations of father Plato and his Allegory of the Cave (Plato, Book VII). As you may recall, this parable depicts humankind as fixed in place, staring at the wall of a cave. Some distance behind them, unseen, there is a large fire, and various objects are paraded in front of the fire. The shadows of the objects are visible on the wall of the cave, in front of the denizens emplaced there, and they take those shadows as ‘reality’. Finally, one cave person is taken out into the light, where there is a different world and ‘real’ objects. . .not merely their shadows. When that person returns to the cave, however, his former compatriots will not believe him and go on staring at the shadows on the wall, believing that they are ‘reality’. The assumption of the parable is that the ideal foundations of life have always been there, but that a befuddled mankind has lost its way (Gibson 2006, p. 159). From this point of view, ‘Inside the cave’ illustrates a view of humanity in error—an abject, ‘fallen’, and ‘lesser’ humanity. No creative event of truth can happen there because the ‘Truth’ is depicted as a pre-existing ideal world, a thing outside in the light (ibid., pp. 202–203). Such an ideal becomes the goal to be sought, the telos. Plato’s Allegory is reminiscent of some conventional views of the analytic situation! Like the cave dwellers, we are at first unaware of the illusionary state in which we exist. When we become aware of the degree of our lostness and blindness it terrifies us, and we search for foundational certainties that will provide an escape. The fantasy of a place ‘outside’ our condition, one that transcends our sense of helplessness and suffering, continually magnetizes us (Carel 2001, p. 2). This picture has largely dominated the course of Western theology and philosophy, and is related to Jung’s conception of the Unus Mundus. Indeed, he specifically equates his viewpoint with Plato’s Allegory (Jung 1963/1970, para. 768), and describes it as restoring the ‘potential world of the first day of Creation’, the ‘eternal Ground’ of the empirical world ‘before things were divided into a multiplicity’ (ibid., para. 760). Such utopian views valorize the possibility of seeing from an ‘objective’ position ‘outside the cave’, which is impossible; from where could that position itself be observed and validated? In an attempt to solve this problem, Jung asserts the existence of an ‘objective’, Archimedean point by positing the concept of the ‘psychoid’, a ‘non-psychic’ structure that is ‘neither mind nor matter’ 1960/1969, para. 417; para. 439, n. 130; para. 840). However, this merely shifts the illusion of objectivity and control to another level (Brooks 2009). Like other Utopian views, it ends in a tautology: how does the eye see itself? (Zˇ izˇek 2008). Jung himself sometimes raises the question of ‘whether the soul could be known through itself’, but this perspective usually becomes subsumed to his search for universals (Jung 1954, para 161 ff. ; Shamdasani 2003, p. 89; p. 94ff.). Jung’s theoretical construct, although it has inspired many practitioners as an ideal, in the end foundered. That may be due to his isolation from emerging perspectives that would have challenged the assumptions of the prevailing zeitgeist, and opened new dimensions in his work (Brooks 2009). A broader consequence of valorizing a ‘larger, purer’ totality is that it tends to minimize the raw particulars of human suffering. Seen through the lens of the Utopian gaze, suffering is often depicted as an unfortunate but necessary dimension of the path toward an idealized unity (Levinas 1998, pp. 91–102). Levinas repeatedly points out that such a totalizing point of view tends to obscure the ethical call of the singular Face of the Other and the stark reality of useless suffering (Levinas 1969, pp. 21–30 & 194–219). Contemporary postmodern thought offers a different view of the universe. It eschews utopian totalities that employ foundational principles. Based on speculations about an unknowable realm, such principles have no necessary relationship to the particulars of existence. In contrast, the postmodern ethos values particulars. In this view Being is always situated, and we are always divided subjects in our ‘worlds’. There is no experience of Being beyond all structure, beyond the situations in which we find ourselves (Gibson 2006, p. 45). In contrast to visions of totality, there is a fundamental incompleteness of reality itself that terrifies us (Johnston 2008, p. 5). Things being together do not indicate that they constitute a unity; and what we tend to call ‘opposites’ are actually ‘parallax views’ that cannot be ‘reconciled’ (Zˇizˇek 2006). Our knowledge is always condemned, in Lacanian terms, to be ‘non-all’, intrinsically lacking, invariably ending in enigma. This is an ontology of gaps and abysses, and the very structure of our subjectivity is a manifestation of such divisions. Jean Laplanche has carefully delineated this view, highlighting the prominence of enigmatic elements in the earliest formation of the subject (Laplanche 1999; Hinton 2009). As a consequence, we are ‘constitutionally unable to keep things fixed and forever immune to disruption and change’ (Lear 2000, p. 112). However, the subject, when realizing this situation, may become a ‘crack’ in the very foundation of fundamental systems. Disruptiveness offers us something precious by opening up fields of possibilities (Carel 2001, p. 6). Leaving the apparent comfort of life as a ‘normal’ automaton involves bearing the awareness of gaps or ‘black holes’ in consciousness; but such ‘cracks’ are also, paradoxically, the basis of human freedom (Zˇ izˇek 2006, pp. 25, 65, 88–90). This reverses Plato’s journey. Consciousness or reflection indeed results in an awareness of what we creatures in the Cave lack; but a ‘higher’ unity or wholeness, a thing or substance that is the incarnation of ultimate Truth, always eludes our grasp like a phantom unicorn. The crucial point is that, in the process of descent into our cave-like depths, we may momentarily experience the void of an always-missed encounter with unity, with ‘unprethinkable being’ (Gabriel & Zˇ izˇek 2009). It is such experiences that can open the space of the subject for poetry, new thoughts, images, and sometimes laughter (ibid., pp. 26–85; Bakhtin 1984; Gibson 2006, 54–55; Hinton 2002; Johnston 2008, p. 83).2 This is the essence of the analytic task. [with given tradition, with ‘totality’] that can open new horizons (Lear 2000, p. 154). As Freud supposedly said to Jung as they were travelling to America to speak at Clark University, ‘They don’t know that we’re bringing the plague!’. My sons will describe and discuss several dimensions of human experience that present deep moral challenges to any system of universal ‘explanation’. These limit-situations will dramatically underline some problematic effects of concepts of totality. Confronting such disturbing ‘errors’ can help open the way toward richer dimensions of thought and practice. First, my son Ladson will present the disturbing picture of the ‘Alzheimer-ed’ person that shows how quickly we want to abject and disown whatever disturbs our sense of truth and order. It brings the notion of teleology quickly into doubt. What could possibly be the ‘goal’ of such suffering? Its manifestations disturb our sense of meaning and obliterate any illusion of certainty. What ‘eternal Idea’ from outside the Cave could possibly provide an explanation and justification? Next, Devon will describe the Utopian modernist vision of a never- ending ‘progress’ that privileges moving people and products rapidly between centres of production and commerce, and has often led to the destruction of intimate human dwelling. The uncontained speed of late capitalism has resulted in the city spaces of agoraphobia, evoking the primal scream so vividly illustrated by the paintings of Edvard Munch. Virilio has described this world as a ‘Museum of Accidents’ (Virilio 2003, p. 58 ff.). This conveys the underlying, horrifying excess in our culture, a ‘Real’ that reason cannot contain. Finally, Alex will discuss how the genocidal activities of our era are often motivated by a yearning for ‘purity’ or Truth, like the imaginary world of light outside Plato’s Cave. When the ideal is unity there is always the tendency to abject those who are cast as preventing the achievement of Utopia. The horror of genocide is a prism that magnifies the all-too-human tendency to eliminate the troubling ‘other’, whom we blame for disrupting our personal or social worlds. In our anxious yearning to escape the reality of the human condition, the ‘solution’ is all too often the eradication of the messy and troubling ‘Face of the Other’ of whole populations. My thanks to Michael Horne for his very helpful editing. Aziz, R. (1990). C. G. Jung’s Psychology of Religion and Synchronicity. Albany: State University of New York Press. Bakhtin, M. (1984). Rabelais and His World. Trans. H. Iswolsky. Bloomington: Indiana University Press. Brooks, R. M. (2009). An Interpretation of Carl Jung’s Use of Phenomenology and Hermeneutics. Unpublished Monograph. Carel, H. (2001). ‘Review of Happiness, Death and the Remainder of Life by Jonathan Lear’. Metapsychology Online Reviews, 5, 10. Gabriel, M. & Zˇizˇek, S. (2009). Mythology, Madness and Laughter: Subjectivity in German Idealism. New York: Continuum Books. Gibson, A. (2006). Beckett and Badiou: The Pathos of Intermittency. Oxford: Oxford University Press. Hinton, L. (2002). ‘Laughter, humor and transcendence’. Lecture presented at the C. G. Jung Society of Seattle. —— (2009). ‘The enigmatic signifier and the decentred subject’. Journal of Analytical Psychology, 54, 4, 637–57. Johnston,A.(2008).Zˇizˇek’sOntology.Evanston:NorthwesternUniversityPress. Jung, C. G. (1960/1969). The Structure and Dynamics of the Psyche. CW 8. —— (1963/1970). Mysterium Coniunctionis. CW 14. —— (1954). The Development of Personality. CW 17. Lear, J. (2000). Happiness, Death, and the Remainder of Life. Cambridge: Harvard University Press. Levinas, E. (1969). Totality and Infinity. Pittsburgh: Duquesne University Press. Peperzak, A. T. (1997). Beyond: The Philosophy of Emmanuel Levinas. Evanston: Northwestern University Press. Plato. (1942). The Republic. Trans. B. Jowett. Roslyn, NY: Walter J. Black. Samuels, A. (1985). Jung and the Post-Jungians. London: Routledge & Kegan Paul. Shamdasani, S. (2003). Jung and the Making of Modern Psychology: The Dream of a Science. Cambridge: Cambridge University Press. Virilio, P. (2003). Unknown Quantity. New York: Thames & Hudson. von Franz, M.-L. (1975). C. G. Jung: His Myth in Our Time. New York: C.G. Jung Foundation. Zˇ izˇek, S. (2008). ‘The ambiguity of the Utopian gaze’. Umbr(a). —— (2006). The Parallax View. Cambridge: MIT Press. Then they left her alone as quickly as possible. They were politely kind to her when they ran into her, but they didn’t run into her very often. This was largely because of their busy schedules and Alice’s now rather empty one. Facing her meant facing her mental frailty and the unavoidable thought that, in the blink of an eye, it could happen to them. Facing her was scary. The above passage is from the book Still Alice, this fictional account of the experience of Alice Howland, a Harvard Psychology Professor who was diagnosed with early-onset Alzheimer’s disease (AD). The book portrays changes over time in the subjectivity of a person with AD, from early and subtle symptoms to the point of profound difficulties in recent memory and functioning. Without the anchor of recent memory, her world unravels and fragments and is often profoundly distressing to her. Alice’s presence and her suffering also create discomfort in others. They avoid her, have difficulty ‘facing’ her. Genova’s account focuses our attention on the illness experiences and moral dimensions of the interpersonal response to the suffering other in the context of Alzheimer’s. To illuminate these issues, this paper draws on Emmanuel Levinas’ work and focuses on the moral and ethical imperative and challenges of engaging persons with Alzheimer’s. It has three parts. First, I consider briefly the emerging body of work on Alzheimer’s and subjectivity, highlighting its multiplicity. Next, I examine key concepts from Levinas’ work, particularly the moral and ethical challenges of the relationship between self and other in the context of suffering. Third, I highlight the contemporary ‘objectification’ of the subjectivity of the person with Alzheimer’s—transforming them into an ‘Alzheimer-ed subject’ and impeding empathic connection. In contrast to the sense of homogeneity evoked by monolithic categories such as Alzheimer’s disease, there is a burgeoning literature on the subjectivity of persons with Alzheimer’s from first person and caregiver accounts, art, literature, and studies in gerontology and the social sciences that emphasize the heterogeneity in the process and experience of this disease (Leibing & Cohen 2006). This is probably apparent to many of us when we reflect on family members, friends, or patients who have developed Alzheimer’s. The disease may trigger an emergence of new aspects of personality or an accentuation of prior traits with sometimes quite unexpected consequences—both positive and negative—for interpersonal relationships. I would like to discuss the work of William Utermohle, a well known artist who continued to paint after he was diagnosed with Alzheimer’s in 1996. In his paintings we see increasing abstraction and fragmentation perhaps reflecting the artist’s struggles to maintain self-awareness. There is also a more vivid use of colour in some of his self-portraits pointing to the complex interplay of creativity and the disease process. Bursts of artistic creativity are not uncommon in persons with Alzheimer’s, even those who are not professional artists. Studies grounded in the social sciences suggest that selfhood is preserved in Alzheimer’s but altered through the interaction of pre-existing personality, brain-based changes in cognition and personality, as well as social interactions. Even the clinical literature on AD reveals remarkable heterogeneity based on illness severity, patterns of cognitive impairment, the presence of a diverse set of psychologically-based symptoms, and the extent to which insight is preserved. Brain-based Alzheimer’s research highlights striking variability in the pattern and nature of brain changes—so much so that many believe Alzheimer’s will be dis-aggregated to reveal multiple distinct brain diseases. Because basic, and for us taken-for-granted cognitive functions, such as short term memory, insight, and the ability to think abstractly or form coherent narratives, are altered in Alzheimer’s, our ability to understand the the subjectivity of the person with Alzheimer’s is compromised, posing profound problems for our capacity to imagine ourselves in their place. The altered subjectivity of the person with Alzheimer’s creates challenges for us in our attempts to engage and empathize. However, from the standpoint of Emmanuel Levinas, we have a moral and ethical imperative to do so (Levinas 1998). For him, the relationship to the other is a fundamental ethic that precedes all other considerations. Too often, the relationship of the self and other is one of identity—what in analytic terms we might refer to as narcissism, loving others because they are ‘just like us’. In contrast, for Levinas, the self can only become fully aware of itself as a social and ethical being when the relationship of self and other is experienced as one of non-identity, of the essential otherness of the other. This requires acknowledging the singularity and uniqueness of the other and also their un- knowability. Levinas uses the phrase ‘facing the other’ in his philosophical work to articulate this fundamental relationship of self and other. Our ability to see the ‘face’ of the other is complicated by the fact that the other is at the core unknowable, leaving us with only a partial understanding and appreciation for the subjectivity of the other. Each person carries what Levinas refers to as the ‘trace of the infinite’ that is beyond the capacity of the mind to know. Indeed, we cannot fully know ourselves. Levinas emphasizes that we face our greatest ethical challenge when confronting the other who is suffering. The suffering other must be ‘welcomed’ and acknowledged without resort to construction of meanings that in any way ‘explain’ or justify their agonies. Thus, Levinas highlights our need to understand how such constructions may become defensive vehicles that amplify suffering, or justify its existence through teleology. Indeed, it is only through recognition that suffering is often ‘meaningless’ that there can be an authentic connection with the other (Edgar 2007; Seeman 2004). Levinas’ work is useful for thinking about engagement with the subjectivity of persons with Alzheimer’s in two important respects. First, it turns our attention away from the ‘consequences’ of Alzheimer’s and the instrumental aspects of caregiving, to the relational aspect, the engagement with the person and their subjectivity as a core moral and ethical task. His work thus offers an alternative theoretical framework for caregiving (Kleinman 2009). Second, this engagement becomes even more imperative because suffering is common among persons with Alzheimer’s; their suffering and ‘otherness’ conspire in shaping our own desire to ‘turn away’ or to rationalize that which we encounter. There is a certain irony in using Levinas’ work in this context, for he was himself afflicted with Alzheimer’s late in his life. I suggest that what keeps us from ‘seeing the face’ of the person with Alzheimer’s is that the disease constitutes a symbolic threat on several levels (Cohen 1998). Alzheimer’s threatens core Western Anglo-American and stereotypically masculine values of self-sufficiency, independence, and rationality (Herskovits & Mitteness 1994). Persons with Alzheimer’s are also threatening to us because they have come to represent for us a kind of ‘death in life’, or transitional zone between life and death, reminding us of the certainty and uncontrollability of our own personal deaths. The public discourse on AD borders on the apocalyptic, such as the warnings about the looming ‘tsunami’ of persons with AD and the threat to our economy, healthcare system, and to caregivers. In this catastrophic mode of thinking, the label of Alzheimer’s and by extension the afflicted person evokes a sense of foreboding and uncontrollability that is anxiety-provoking. Lay representations of the subjectivity of the person with AD are equally obfuscating. For example, attributing changes related to Alzheimer’s disease to ‘normal ageing’, while deflecting stigma, ignores the profound alterations in subjectivity. Condescending references to behavioural changes in old age as a ‘second childhood’ or ‘craziness’ also serve to stigmatize and diminish the personhood of the person with AD. In social interactions the personhood is also diminished by ignoring the person with Alzheimer’s, because their presence is discomforting or awkward to us or because we assume they cannot speak for themselves. Thus, from a sociological perspective, the label of AD does important ‘work’ on the identity of the afflicted person—they become ‘Alzheimer-ed subjects’. Or to use Jungian parlance, they become the recipients of a whole set of projections that facilitate a turning away, thereby amplifying the suffering of those with the disease, as well as the isolation and suffering of those who provide care. Suffering is common among persons with AD. The extreme distress, for example, of facing a world without the anchor of recent memory is described in Still Alice. Yet there is a powerful professional tendency towards medicalization of this suffering, leading to costly pharmaceutical interventions that are of marginal benefit or even harmful. Distress becomes ‘neuropsychiatric symptoms’ or ‘problem behaviours’ reflecting underlying brain disease, ignoring the complexity of these symptoms when viewed in the context of interpersonal relationships and personal history (Hinton et al. 2006). In the process, the subjectivity (i.e., the suffering) of the person with AD is pushed to the margins and the focus becomes a materialistic view of the psyche in which alterations in mood, anxiety, and reality orientation become symptoms of a deteriorating brain and there is a shift and exclusive focus on the ‘burdens’ and consequences for caregivers. Biomedicine’s reductionistic tendencies remind us of the search for ‘Truth’ in the allegory of the cave as mentioned in my father’s talk! In the end, the label of Alzheimer’s carries layers of projections and associated stigma preventing a genuine engagement with the afflicted person’s subjectivity. But Alzheimer’s threatens us in yet another way more central to the analyst’s work. The radical transformation of the subjectivity in Alzheimer’s is a challenge to our own commonplace assumptions about the knowability of others. The ‘gulf’ between ourselves and others is often kept out of view—in Levinas’ perspective others are viewed more as extensions of the self rather than constituted as ‘others’. The sheer ‘otherness’ of the Alzheimer-ed person poses a potential narcissistic threat to us. Given these challenges, what is the way forward towards a more genuine engagement with the subjectivity of the person with AD? Here we turn again to Levinas, as well as depth psychology. In this vein, we must become aware of our projections and bear the anxiety or other uncomfortable emotions that the Alzheimer-ed other evokes in us. Seen through the lens of Levinas’ perspective, this radical otherness is closely akin to the otherness of the others around us all the time—a reality that we daily deny and evade. One might say that in the process of confronting our own projections and uncomfortableness, we become more fully human and alive (Kleinman 2009). We are all unknowable at the core, and allowing ourselves to be affected by the unknowability of the Alzheimer-ed other can open a deepened connection to all the faces that we meet. Our projections and rationalizations are our search for the same explanatory forms behind the screen that will relieve us of the terror of unknowability. Such ‘ultimate meanings’ very often obscure and ‘explain away’, rather than enabling us to be more truly present in the world. Levinas would remind us that our own quick tendency for meaning-making, exemplified by the abundant cultural meanings of the term ‘Alzheimer’s’, must be set aside to enable more direct connection with the singularity of the Alzheimer-ed other, and ultimately to self and world. Beard, R.L. (2004). ‘In their voices: Identity preservation and experiences of Alzheimer’s disease’. Journal of Aging Studies, 18, 415–28. Edgar, A. (2007) ‘The art of useless suffering’. Medicine, Health Care and Philosophy, 10, 395–405. Genova, L. (2007). Still Alice. New York: Simon and Schuster. Herskovits, E. & Mitteness, L. (1994). ‘Transgressions and sickness in old age’. Journal of Aging Studies, 8, 3, 327–40. Hinton, L., Flores, Y., Franz, C., Hernandez, I., Mitteness, L.S. (2006). ‘The borderlands of primary care: family and primary care physician perspectives on “Troublesome” behaviors of people with dementia’. In Thinking about Dementia – Culture, Loss, and the Anthropology of Senility, eds. A. Leibing & L. Cohen. New Brunswick: Rutgers University Press, 43–63. Kleinman, A. (2009). ‘Caregiving: the odyssey of becoming more human’. Lancet, 373, 292–3. Leibing, A. & Cohen, L. (Eds) (2006). Thinking about Dementia. New York: Rutgers. Levinas, E. (1998). Entre Nous: Thinking-of-the-Other. New York: Columbia. Seeman, D. (2004). ‘Otherwise than meaning: on the generosity of ritual’. Social Analysis, 48, 2, 55–71. ‘The eternal silence of these infinite spaces frightens me’ Descartes (1670). What we now call agoraphobia, a panic-like reaction to external urban spaces, became a common experience only in the last twenty years of the nineteenth century. It is a malady of modernity. This malady seemingly came into being because of three historical factors: 1) The cityscape changed into an architectonics of straight corridors and voids (Vidler 2000); 2) These corridors were traversed by accelerating pedestrian and vehicular traffic— by the ‘mobile and anonymous crowd that lies at the heart of modern sensibility’ (Nochlin 1994, p. 26); and (3) Fin de sie`cle fears arose about neurasthenia, sensory overload, and degeneration. Edvard Munch was one of the fin de sie`cle’s neurasthenic panickers. Utilizing, in hyperbolic form, artistic techniques that were developed by artistic predecessors—Renaissance artists (linear perspective), the Impressionists (techniques for depicting motion), and Art Nouveau (the apotheosis of the swirl)—Munch pictorially constructed a nightmare of fear and vertigo, the modern cityscape as a draining place of chaos, anomie, and excessive hurry. In his four paintings, Despair (1892), Evening on Karl Johan Street (1892), The Scream (1893), and Anxiety (1894), Munch depicted his own agoraphobia-type panic attacks (Hinton 2000). Haussmann transformed Paris from a city of winding streets lacking sidewalks, with shopping centred on arcades, to a metropolis of endless, straight streets bordered by sidewalks and rectilinear, bilaterally symmetrical buildings, bring- ing into existence the so-called corridor street (Giedion 1941), a perspective theatre of converging lines racing towards the vanishing point. And increasingly, pedestrian and vehicular traffic dominated the new sidewalks and roads of the cafe ́-, store-, business-, and apartment-lined avenues. In a sense, the Haussmann street was an accelerated version of the covered arcades (on the arcade, see Benjamin 1999) combining the perspective theatre (i.e., long-corridor streets and shopping arcades of repeating elements), consumerism, and agitated activity; it was the mega-arcade, open to the sky, and racing to infinity. In order to understand the emergence of agoraphobia, it must be situated within its medical-social-technological context. Starting in the 1870s, doctors increasingly worried that exhaustion led to ‘irritable weakness’, that is, a weakness characterized by a hyperreactive nervous system that was particularly prone to activation by external stimuli (Krishaber 1873). Neurasthenia, Beard’s diagnosis (1880), became the best-known system to explain the causes and symptoms of such ‘irritable weakness’. It was in the context of ‘irritable weakness’ and neurasthenia, and of associated medical, sociological, technological, and architectural shifts, that the diagnosis of agoraphobia emerged, the latter configured as a weakened nervous system’s spasms in response to urban stimuli. It was not a square in the true sense, rather being formed by street confluences; it lacked a container effect. Owing to the heavy volume of traffic, it was filled with a bothersome din and was difficult to cross. Several long straight streets converged on an open area, channelling streams of wind, often thick with dirt, toward the central plaza, where they proceeded to whirl. Because of the homogenous nature of the streets, people felt disoriented and were unable to easily locate the desired street. In a circular plaza, the experience of walking in a circle, and the view of the circular form itself, worsened the feeling of dizziness. At such plazas people were suddenly confronted with a frightening multiplicity of views stretching to infinity, the infinite perspective into nowhere of Haussmann’s ‘corridor street’, but multiplied. The emergence of agoraphobia during a period of intense modernization in four of the most populated and radically transformed cities—Vienna, Berlin, Paris, New York—would seem to be no coincidence. Let us take the example of Paris. Before its industrialization, most city streets meandered; and when straight avenues were built, they led to some goal: a plaza containing a fountain, a church, a statue—most often, of the King—or some other point of regal, state, or spiritual importance. But after Haussmannization, a new urban geometry was created. Owing to the straightness of the avenues and the similarity of the buildings, the new cityscape presented—in overwhelming abundance—the phenomenon of the vanishing axis (Panofsky 1997); multiple diagonal lines converged, as in the diagonals of the street, the sidewalk, the roof tops, and the building elements. But the new perspective theatre of the ‘corridor street’ led nowhere and evoked existential questions and became an ever-present metaphor built into architecture: What is found at the point of infinity? What is sacred? Where is my life leading? Am I going nowhere? Is there life after death? What is the meaning of my life? Additionally, size perspective increased the sense of deep space and speed. That is, standardized repeating units, such as carriages and omnibuses and windows, as well as people, appear to become progressively smaller in the distance in the x-and-y axis space, the Descartian space, of the new modern street, creating a feeling of deep space and acceleration. And vast spaces were opened as grand boulevards and large-scale public squares (Vidler 2000). The intoxicating sense of the void and speed were heightened by other aspects of ‘modern’ culture: outdoor spaces presented images of industrialization (wheels in motion and the frenetic city landscape) and the urban crowds rushing to work or hurriedly purchasing goods. The new environment was dizzying through its hurtling linear perspectives and speed, through its voids, through its extreme chaotic complexity, and through its presentation of infinite choice. That is the time for cosmology making. Jung researched such a radical cosmology making that is also a therapy in his medical doctoral thesis on a spirit medium. Or too, as pioneered by a Jungian, Dora Kalff, there is the time to return to the void space of the sand tray and in that space to create a cosmology in miniature. Broken cosmologies necessitate the creating of radically new ones. This is true not only of societies and cultures, as described by Foucault (1994), but also individuals. And persons are also located in those macro-level historical shifts, and at times of those shifts, illnesses like agoraphobia may certainly become more frequent as old meaning structures lose their lustre— and as new, disorienting, infinity- and motion-filled environments emerge; the new modernity finds ever new ways to make dizzy and giddy—Modernity’s ‘Rorschach’. In this sense, the agoraphobic dizziness is a call to being, a reminder that the old cosmology does not suit the factuality of the now. Such an agoraphobia can serve as a ‘sinthome’ in Lacan’s sense (see Bailly 2009), a symptom that makes one attend to the fact of a basic existential wasteland that one’s being will not tolerate. In this sense, agoraphobia, ironically, invites to an adventure, a movement beyond the old self. Munch’s Scream is such a call to arms, and his art was the attempted personal answer to that call. It was his creation of a new pictorial space, a symbolist-realist space of exquisite expressivity. Other modern artists also inquire pictorially about what to place in the space of infinity, in the converging diagonals of infinity, both at the level of the individual and a culture. Anselm Keifer is an exemplary case in point, as he struggles to confront Germany’s past on a personal and societal level: Germany’s Spiritual Heroes (1973), or Innenraum (1981). Such inquiries may be launched by personally initiated seekings, existential angst, or forced upon one by agoraphobic terror. Bailly, L. (2009). Lacan: A Beginner’s Guide. Oxford: One World Publication. Beard, G. (1880). A Practical Treatise on Nervous Exhaustion (Neurasthenia) its Symptoms, Nature, Sequences, Treatment. New York: William Wood. Benjamin, W. (1999). The Arcades Project. Cambridge: Harvard University Press. Collins, G., and Collins, C. (1965). Camillo Sitte and the Birth of Modern City Planning. New York: Random House. Foucault, M. (1994). The Order of Things: An Archaeology of the Human Sciences. New York: Vintage. Giedion, S. (1941). Space, Time, and Architecture: The Growth of a New Tradition. Cambridge: Harvard University Press. Hinton, D. (2002). ‘Munch, agoraphobia, and the terrors of the modernizing landscape’. In Panic: Origins, Insight, and Treatment, eds. L. Schmidt, B. Warner. Berkeley: North Atlantic Books, 229–52. Jung, C. (1902). 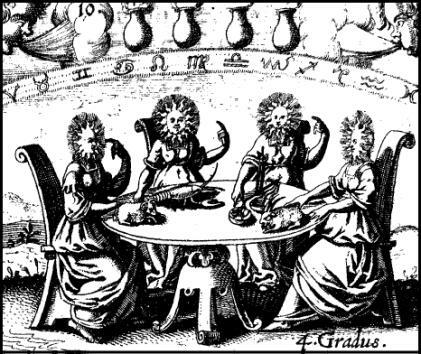 ‘On the psychology and pathology of so-called occult phenomena’. CW 1. Krishaber, M. (1873). De la Ne ́vropathie Ce ́re ́bro-Cardiaque. Paris: Librairie de l’Acade ́mie de Me ́decine de Paris. Nochlin, L. (1994). The Body in Pieces; The Fragment as a Metaphor of Modernity. New York: Thames & Hudson. Panofsky. E. (1997). Perspective as Symbolic Form. New York: Zone. Pascal, B. (1670/1991). Pense ́es. Ed. P. Sellier. Paris: Bordas. Schapiro, M. (1997). Impressionism, Reflections and Perceptions. New York: Braziller. Sitte, C. (1945 ). The Art of Building Cities. New York: Reinhold Publishing. Vidler, A. (2000). Warped Space: Art, Architecture, and Anxiety in Modern Culture. Cambridge: MIT Press. Yeats, W.B. (1919). Michael Robartes and the Dancer. Chruchtown, Dundrum, Ireland: Chuala Press. For the last year and a half, I have been attending the trial of Duch, the first former Khmer Rouge leader to be tried in a new court that has been set up in Cambodia, where over 1.7 million of Cambodia’s 8 million inhabitants perished of disease, starvation, overwork, and execution from 1975–1979 (Hinton 2005). Duch was the commandant of Tuol Sleng, a former high school that the regime converted into an interrogation and torture centre. More than 12,272 people passed through its gates. Some, usually women and children, were killed relatively quickly. Others endured prolonged interrogation and torture until they ‘confessed’ their treason. Soon thereafter, the prisoners were executed and dumped into mass graves. ultimately he claimed he was a cog in the machine, a regular Eichmann, just following orders to save himself and his family as a revolution he no longer believed in fell apart. 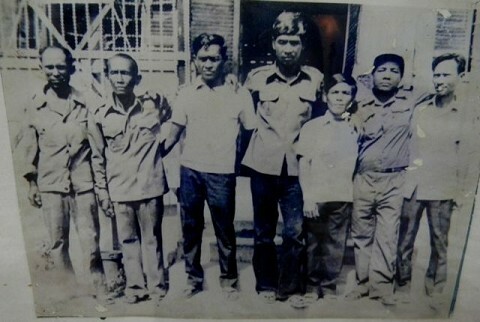 Almost all of the handful of survivors of Tuol Sleng and the relatives of the prisoners who died there refused to accept his apology and think he is lying. The truth, beyond the basic outlines of how Tuol Sleng worked, the horrible fate of the people who were tortured and killed there, and the generational rings of trauma and suffering that ensued, is hard to find. The perpetrators seem like regular Joes. The havoc they wreaked seems inexplicable. And yet we all want to know: why? For some, answering this question may provide a degree of closure and healing. For others, it may be the key to prevention. Most would agree that we need the truth to hold wrong-doers accountable. The merits of the above notwithstanding, we can also approach the question from a different direction, considering the epistemology of the truth—truth as a discursive category. Or we might ask it this way: how do we come to seek certain types of truth and what sorts of consequences may ensue once the Truth supposedly has been found. Let’s shift away from the court, back to Democratic Kampuchea, the period of Khmer Rouge rule. Like many other genocide regimes, the Khmer Rouge rose to power in a context of upheaval—civil war, regime change, and the geopolitical conflict—one that destabilized the existing moral order and raised basic existential questions. It is at such moments that groups promising renewal often rise to power. Sometimes such movements are relatively benign; in other cases, like the Nazis, the Young Turks, and the Khmer Rouge, the groundwork of genocide begins to be laid bare. For genocidaires invariably claim to have discovered the truth and devise a blueprint of renewal based upon it. And here the story becomes all too modern and familiar. For they draw inspiration from the same Enlightenment, high modernist-inspired aspirations that most of us do. Genocidaires, ironically, are public health specialists, albeit twisted ones. We should all be discomforted by this thought. We are enmeshed in a world of prescription in the name of the social good—for better or worse. While the difference between the Nazis or Khmer Rouge and the AMA is significant, ultimately they share the high modernist spirit of liberal emancipation. I am not suggesting we abandon all public health measures, but we would do well to consider the spirit of self-righteousness and purity with which they are all-too- often imbued (think, for example, of current devaluation of smokers) and the ease with which such actions may stigmatize and categorize people, reducing them into types with essential characteristics. This is exactly what genocidal regimes do. They find traction when there is a social disorder, a social body seemingly under attack. Using their ‘enlightened’ insights, they diagnose the threat and offer a prescription for its cure (eradication of the contaminating element). For the Khmer Rouge, the disorder was class oppression and neo-imperialism, the method of analysis was the ‘science’ of Marxist-Leninism, the threat was ‘hidden enemies burrowing from within’, and the cure was their extermination in the sense of ridding the body politic of a pestilence. Similarly, Nazi discourse is suffused with racial hygiene metaphors— Jews as vermin, a disease, and so forth—interspersed with reference to the idyllic (and pure) Aryan volk. It is all too easy to distance ourselves from the extremes of genocide. This would be a mistake for it is exactly the extremes of genocide that may yield insight into more everyday processes. Bullying, stereotyping, and peer pressure are just a few examples. Another is provided by my brother Ladson’s paper. Here we find a diagnostic category, Alzheimer’s, which is codified and reified and yet, when we look closer, turns out to be suffused with categorical murk. And there are power dynamics at play as we turn from those ‘Alzheimer-ed subjects’, to use his term, that we categorize as less than human because they make us feel discomfort or even terror. And here we arrive at a second key reason: we often want the Truth, whether in the form of a public health prescription or a diagnostic category to allay stress and anxiety and buttress one’s sense of being. Living without the certainty of Truth creates anxiety and dread even if the gaps in our understanding also can be the very basis of creativity as my Father’s paper so nicely describes. As he demonstrates, we think it a bummer to be confined to ‘the Cave’, the rather limited sphere that is our reality. It affects our pride, our very sense of being. Our limitations make us feel ashamed. Our search for certainty, purity, progress, ‘the Way’, transcendence, the Truth—and yes, for the unus mundus—is in a sense an opiate, a mask that also allows us the illusion of escape from our finitude and to feel affirmed, whole, and good. But the pure Truth does not exist in the sense of a universal objective reality. What we have instead are a multitude of truths linked to different instantiations of being. This might very well suggest that there is a tension in much Western, high-modernist thought: it strives for Truth yet can never reach it. Even as Truth is asserted, an anxiety-generating lack is experienced. The Scream emerges in this tension, a point that my brother Devon deftly illustrates in his discussion of modernity and existential dread. This tension and dread suggest a dialectic of genocide. Genocidal regimes make truth claims that inevitably fall short, unable to encompass the larger diversity and complexity of the world. However, once signs of the limitations of the Truth they have created begin to emerge, genocidal regimes begin to make increasingly extreme efforts to reassert a sense of certainty—not just by eradicating dissent and diversity but by creating places like Tuol Sleng that seem to produce new ‘evidence’ of their Truth—in this case, confessions from those who were ‘guilty’ of undermining the Khmer Rouge version of truth and perfection. To maintain their sense of purity and control, abjected others must be held responsible. 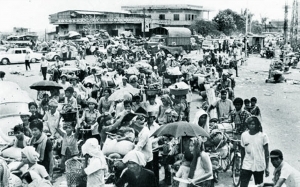 Thus, for the Khmer Rouge, it was traitors—not the leadership’s flawed economic policies that had been developed on the basis of their ‘all-knowing’, Marxist-Leninist political ‘line’—who were responsible for the widespread starvation in the countryside. Such impure ‘impediments’ to a perfect world deserved to be eliminated. In my conclusion I would like to draw attention to a painting by Bou Meng (see p. 393), one of the few survivors of Tuol Sleng and a witness at Duch’s trial. He survived because he was a painter and the Khmer Rouge needed someone to paint pictures of Pol Pot. His wife was not so lucky; she was executed. 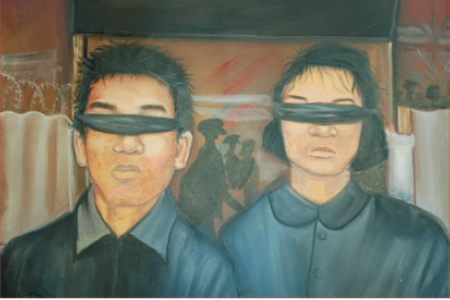 The painting literally depicts Bou Meng and his wife as they arrived at Tuol Sleng blindfolded but more broadly suggests the larger blindness of the ‘all-knowing’ regime that arrested him without reason and, in the context of this paper, the dangers of blindly assuming we ascertain purity and truth among the shadow of the Cave. Each time I go to Cambodia, I try to make at least one trip to Tuol Sleng, which has been turned into a museum. Early in the day, before the tourists have begun to arrive, you can imagine the children who long ago played on the school grounds. But soon enough one begins to ponder what happened at this place. Did the prisoners feel any hope? What could make a person torture another human being? And what did Duch say to his wife and children when he returned home at night? We have learned more from the sketches of Tuol Sleng during the trial, but the image refuses to come fully into shape. Sitting in the courtyard of Tuol Sleng as the morning heat builds, a light wind blows, the branches of the trees sway, a bird takes flight, and such questions are met with silence. Hinton, A. (2005). Why Did They Kill? Cambodia in the Shadow of Genocide. Berkeley: University of California Press.